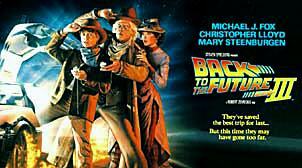 Time traveling teenager, Marty McFly, goes back in time, to 1885, in order to prevent Doc Brown's death at the hands of a bullying, bad guy, named Tanner. This film features action, FX, and romance. The romance between Christopher Lloyd and Mary Steenburgen (Time After Time) is the highlight of the movie. An unforgetable scene involves a train pushing the Delorean up to speed, as both head down the tracks toward a gaping canyon. The FX of a flying, time traveling train are amazing! The cast includes: Michael J. Fox, Christopher Lloyd, Lea Thompson, Thomas F. Wilson, Mary Steenburgen, and Richard Dysart.